Article written for Docklands Forum 1998 – Riverway and the causeway, and the trees are all long gone. The Yacht Club is now at Peartree Wharf – and the Pilot has a planning application in for BIG changes. When the New Millennium Experience site is finished only a few original buildings will remain. These are The Pilot pub and the short row of Georgian cottages, called Ceylon Place. The pub is rightly popular and has recently been extended but, alongside it, the small, dilapidated cottages are rarely given a second look. They are currently in use as short life housing and their downmarket barely reveal their origins as part of what was once an exciting new development at the end of what is now Riverway. The cottages date from about 1801. They were built in the lane behind a ‘big’ house and a huge corn mill which stood on the on the riverfront. In the eighteenth century the site was owned by George Russell, a London soap manufacturer whose works were near Blackfriars Bridge but who lived at Longlands House near Sidcup. In 1801 he was approached by a William Johnson, from Bromley, Kent, who had patented a new design of tide mill. A tide mill is a watermill worked by the power of the tides – a good example can be seen today at Three Mills, behind the Tesco on the northern Blackwall Tunnel approach. 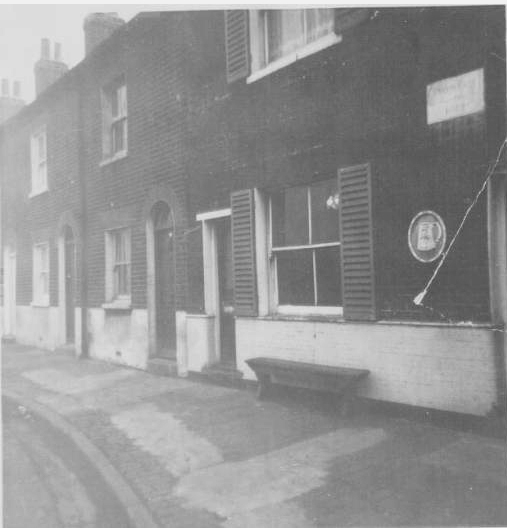 Russell agreed to the project and construction went ahead on the mill – the cottages and the house were included as the start of ‘New East Greenwich’. At the same time Russell got a licence from the City of London to build a causeway down into the river at what was then called ‘Bugsby’s Hole’. This causeway is still in use today. The site – and perhaps George Russell – had some unexplained connections with national politics. In 1801 some of the site was leased to a group of out of office politicians – William Pitt, the recently resigned Prime Minister, his elder brother, the Earl of Chatham, and their associates the Hon.Edward Crags and the Hon. John Eliot. Their role in the development is not clear but it might explain the name of the pub. ‘The Pilot’ is almost certainly named after William Pitt who was described in a contemporary song as ‘The Pilot who weathered the storm’. Ceylon, after which the cottages were named, had recently come under the protection of the British Crown. Two hundred years ago the site must have looked marvellous and romantic. The big mill moving slowly, the big house with gardens going down to the river. Behind it were the cottages and pub overlooking some six acres of millponds with meadows beyond. Nearby was a thatched barn and all around were grazing cows and sheep. Around 1900, when the cottages were a century old, someone built extensions on the backs of them – making them marginally bigger but eating in to what had been pretty gardens. The ‘big house’, East Lodge, was demolished then and its’ site is now used by the Yacht Club. What happened to the summerhouse lookout over the river? Are any of the trees those planted by the Davies sisters who lived there in the nineteenth century? The little cottages have gone on for two two hundred years serving as housing for local workers – fishermen, mill workers, and barge builders. All around things have changed. The great mill became a chemical works and was replaced by a power station. On the fields behind a steel works was built and soon more cottages, a mission room and a café were built in Riverway. All of this has now gone, leaving the old cottages and the pub. The only thing not to have changed seems to be the supply of thirsty workers who drink in The Pilot! rified. Let us hope that English Partnerships and the New Millennium Experience treat them kindly – and take due regard to their age and context. My great grandfather John White, his wife Annie and their family lived at No.1 Ceylon Place and he worked at the Linoleum factory, and the cement works. My Great grandparents, William James Bowen and Hannah Lucy Bowen nee Burton lived at 6 Ceylon Cottages in 1894, they had 10 children and at least 3 of them never reached adulthood. My Great Grandfather was Lighterman. My Gt. Gt. Grandfather’s son Joseph Carter (b: 1811) lived at No. 8 Ceylon Place in 1851 with his wife Eliza and their children Mary Ann, Susan Elizabeth, Kesiah, and John Carter. Joseph was born in Newbury, Berkshire and when he married in 1837 he was a Miller. The family moved to Uxbridge in Middlesex around 1840 and then in 1851 to 8 Ceylon Place where he was still working as a Miller at the huge corn mill. He finally died in 1869 but his son John Carter was still living there in 1871. Peter, my name is Alistair Carter and our records showed that our great grandfather lived at No 1 Ceylon Place, he was a Lighterman.